This past weekend I combined two of my very favorite fall activities: nature hikes and haunted houses. It was certainly an October evening to remember. Nothing beats spending time in nature at the on-set of chilly fall weather - leaves crunching under your feet and the faint smell of burning wood somewhere in the distance. 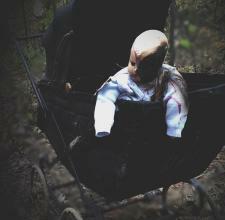 Paired with an eerie, unfamiliar path and over 45 minutes of being chased, frightened and thoroughly disturbed, you’ve got the ultimate heart-pounding experience. If the sound of that peaks your interest, you must check out Exiled KC. 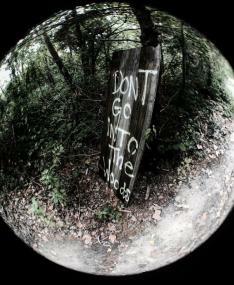 Located in the woods at the home of Zip KC, this “trail of terrors” features a night hike over a mile long in almost complete darkness. At the start of the trail, my group was warned of the real threats lurking in the woods that were not part of the attraction. A woman dressed as a very convincing zombie informed us of the steep drop-offs, large sharp rocks, wild animals and potentially even dangerous humans that we could very well run into if we were to stray from the designated path. That in and of itself was enough to get our blood pumping. We were also told that the use of flashlights and cameras was strictly prohibited. All we were provided with to assist in finding our way along the trail was a small red LED light. As a thrill-seeker I am someone who loves to be scared (not in any type of actual life-threatening situation, obviously). It’s probably because there is something satisfying about leaving your comfort zone and “conquering” something meant to induce panic. So come Halloween time, I am all about the gruesome horror flicks, creepy costumes and haunted houses. This resulted in me being the designated leader of my group, and I was happy to oblige. Usually anytime someone attempts to frighten me, I end up laughing maniacally, which happened throughout most of our hike. (I’m sure my friends didn’t exactly appreciate that, but hey, everyone copes differently.) I think at one point I even had the people that were trying to scare us cracking up due to the loud inappropriate laughter that followed my alarm. My friends’ reactions were a little different. There were multiple times throughout the trail that they shrieked, took off running, and at one point even kneeled down shielding their bodies out of sheer terror. The whole experience was beyond amusing. The effects, costumes, make-up and displays were so well done and quite uncomfortable, which is all you could hope for in a place like this. The hike was no joke either, there were definitely a few falls and several obstacles along the way. My entire group was red-faced, sweating and shaken up when we reached the end.